The Domed Corner Bookcase is a bookcase not just for books but china and collectibles as well. The bookcase features include an arched "domed" top, fluted face molding capped with a crown, and a flat base molding. The bookcase has five adjustable shelves, you can place them at any height that works for your needs. Fits snuggly in a 24" corner depth. A nice corner piece for any room in the house. The Domed 6ft Corner Bookcase creates a beautiful, built-in, custom cabinetry look in a home. 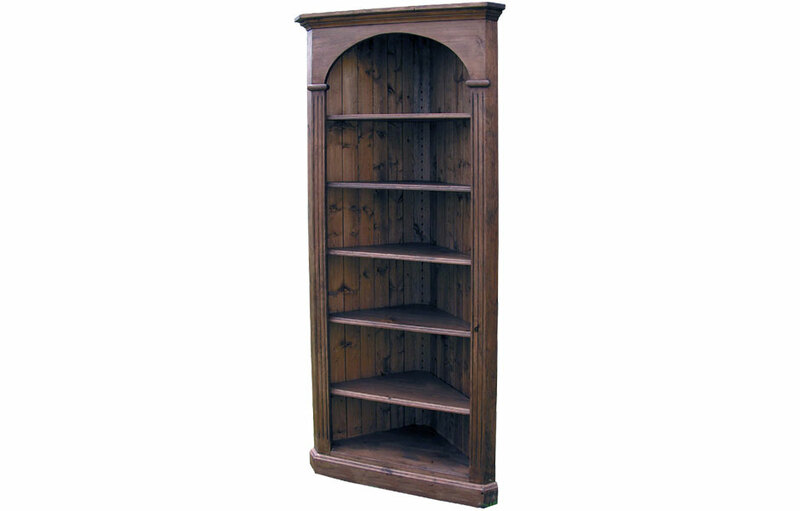 Created to tuck-in tightly to the corner, the country French bookcase looks as if it was built for your house. Traditionally, French country corner cupboards were found in dining rooms. Today, the versatile corner bookcase is found in every room of the home—from a living rooms to home offices and bedrooms—for additional storage. The adjustable shelving providing display area for a variety of items including; books, dishes, and collectibles. Whether purchased as a single corner bookcase or as a "pair" for two corners of a room, the domed corner cupboard adds visual height and structure to a room. The five shelves adjust from small to large to accommodate everything from small books to large china pieces or figurines. The 24" corner depth is perfect for a small corner in a dining room, kitchen or living room. The French country corner bookcase features crown molding, fluted face molding, and a flat base molding. Each corner cabinet is made of solid wood, including a 5/8" pine tongue and groove back. The corner bookcase can be painted and/or stained in a finish of your choice. This Domed Corner Bookcase complements French Country, English Cottage, Farmhouse, Rustic, Transitional and Traditional style decors.